A weekly newspaper is celebrating a breakthrough in its campaign to provide the public with better information about contaminated spring water. 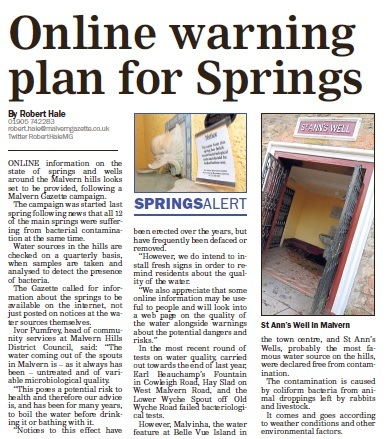 The Malvern Gazette began its Malvern Hills Springs Alert campaign in April, in a bid to get online warnings posted when he water is undrinkable. Spring water in the area is untreated and as such can pose health risks to those drinking it or bathing in it, while various physical warning signs erected at wells throughout the years have been defaced or removed. Malvern Hills District Council has indicated that it has now listened to the Gazette’s argument, including its call for water quality warnings to be posted online. Deputy editor John Wilson said: “It is clear that the present system of warning people about the condition of the spring water is antiquated. “Visitors come from all over the country to sample Malvern’s famous waters, and many wish to drink it there and then direct from the spring. “Imagine their disappointment, though, if they arrive to find a paper note pinned to a spring warning of bacterial contamination. “A simple, online-based notification system would mean people could check the condition of the water before setting out, and so avoid a wasted journey. A useful campaign that actually affects people. Good stuff.